This insightful report on a key market forecasting technique used by the legendary W. D. Gann is very short and very powerful. You'll get the master's clear guidance on the specific dates to watch for trend changes in the markets, no matter what or when you're trading. W. D. Gann was the legendary astro-trader of the early 20th century who created a phenomenal reputation for his incredibly accurate forecasts in the stock and commodities markets. 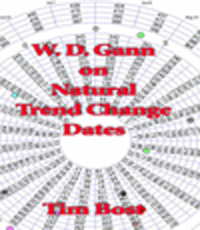 While much of what Gann wrote is obscurely written and difficult to understand, he also provided some precise directions for traders who were looking for the best time to reap profits in the markets. While he paid a lot of attention to long-range planetary cycles and their impact on the markets, he also gave specific instructions about what to look for during each trading month. This insightful report on a key market forecasting technique used by W. D. Gann is very short (it's just 3 pages) but very powerful. You'll get the master's clear guidance on the specific dates to watch for trend changes in the markets, no matter what or when you're trading. Tim Bost exposes the astro-numeric connections in the essence of legendary astro-trader W.D. Gann's Law of Vibration in this 76-page paperback book. In this powerful two-day workshop, renowned market astrologer Tim Bost presents advanced astro-trading techniques that open the door to more profitable results for every trader.